Secret department of the British Ministry of Defense has desperately tried to cover up the extent of its involvement in the UFO research. The ministry went to great lengths to hide data from the recently revealed undisclosed documents made available to the public under the Freedom of Information Act. 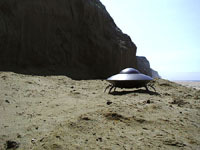 The documents show that the MoD had a secret unit DI55 dedicated to investigating UFOs across the European territory. In the decades of the unit’s research large amounts of data was gathered including testimonies of more than 10,000 witnesses. UFO conspiracy theorists previously considered DI55 a sort of “Men in Black” organization, which was supposed to protect ordinary mortals from alien invasions. When the UFO-enthusiast Julian Hennessy made an attempt to look into the MoD’s records back in 1976 he was refused the access on the grounds that the information was confidential and not of any interest to a serious scientist in any case. However the rejection note also said that the investigation was extensive and its extent should not be mentioned to the public UFO desk. The note only further confirmed Mr. Hennessy’s suspicions that a major cover-up was taking place. August 10, 1965 A man reported seeing a crimson ball fly out of the side of a hill in Warminster, Wiltshire. A fortnight later, another man photographed a UFO in the centre of Warminster. In 1994 it was claimed the photo was a hoax and the object was made from a cotton reel and a button. Boxing Day, 1980 A UFO reportedly crash landed in Rendlesham forest, Suffolk, near the Woodbridge US air force base. The incident was nicknamed Britain's Roswell in a reference to the famous UFO sighting in New Mexico in 1947. Witnesses said the craft was covered in markings similar to Egyptian hieroglyphs and aliens emerged from it. An airman later confessed the incident was a hoax. November 28, 1980 Policeman Alan Godfrey reported seeing a six-metre wide dome-like object hovering in the air in Todmorden, West Yorkshire. He returned to the site with colleagues and they found the area where the object had supposedly been hovering was dry even though the rest of the road was wet because of earlier rain. Early 1990s A string of sightings by residents in north Scotland of a UFO regularly flying overhead at great speed. Documents released earlier this year suggested the aircraft was a spy plane called Aurora, designed by the Americans to take covert pictures of the Soviet Union. May 2006 The MoD released details of Project Condign, a four-year secret study into possible explanations for UFOs. The report concluded that many sightings could be explained as by glowing "plasmas" of gas created by charges of electricity.